Maidenhead, U.K. – Oct. 18, 2016 – Augmented reality, fueled most recently by the Pokémon GO sensation, and virtual reality gaming opportunities are beginning to really open up on mobile platforms. According to IDC, the number of smartphone and tablet gamers should increase to more than 1.9 billion in 2020. Millions of mobile device users are predicted to play these types of games within a few years, and the workplace is not immune. 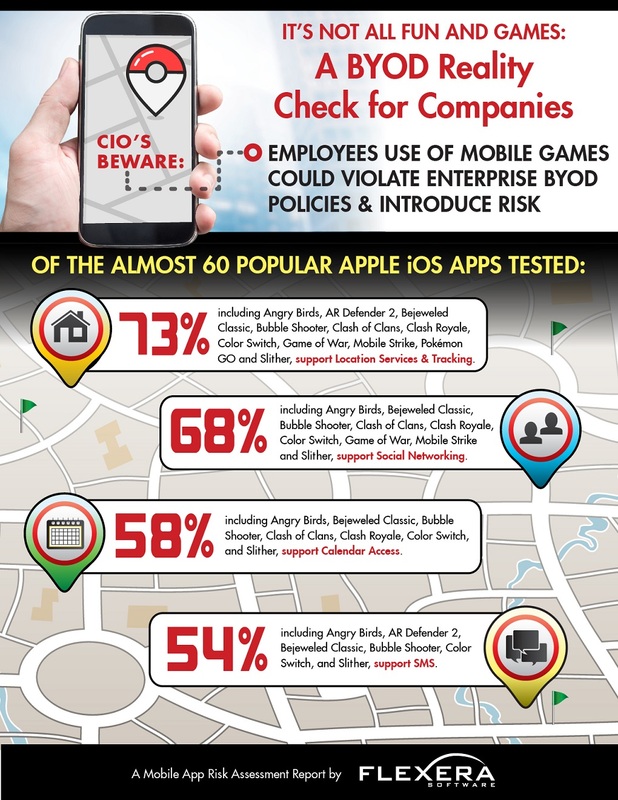 According to a new report, “It’s Not All Fun and Games: A BYOD Reality Check for Companies”, many of these popular apps could violate corporate risk policies. The apps tested were: 100 Balls, Angry Birds, Angry Birds Rio, AR Defender 2, Baby Twins – Terrible Two, Batman: Arkham Underworld, Bejeweled Classic, Bubble Shooter, Buddyman Run, Candy Crush, Clash of Clans, Clash of Kings, Clash Royale, Color Switch, Cookie Jam, Crossy Road, CSR Racing 2, Despicable Me: Minion Rush, Dictator: Emergence, Diner Dash, Disney Emoji Blitz, Doodle Jump Free, Drop Out, Eggs, Inc., Episode – Choose Your Story, Farm Heroes, Farm Heroes Saga, FIFA 16 Ultimate Team, Game of War, Hand of God, Happy Wheels, Harvest Swap, Hay Day, Hungry Shark Evolution, Ingress, Jetpack Joyride, Kendall and Kylie, Micro Machines, Mobile Strike, Mr Jump, NBA Live Mobile, PartyPoker, Piano Tiles, Pokémon GO, Quizduell, Rolling Sky, Slither.io, Snappy Bird: New Season, Soccer Stars, Stack, Steps, Subway Surfers, Talking Tom Gold Run, Temple Run, Temple Run 2, The Sims FreePlay, Walking Dead, Words with Friends and Zynga Poker Classic – Texas Holdem.